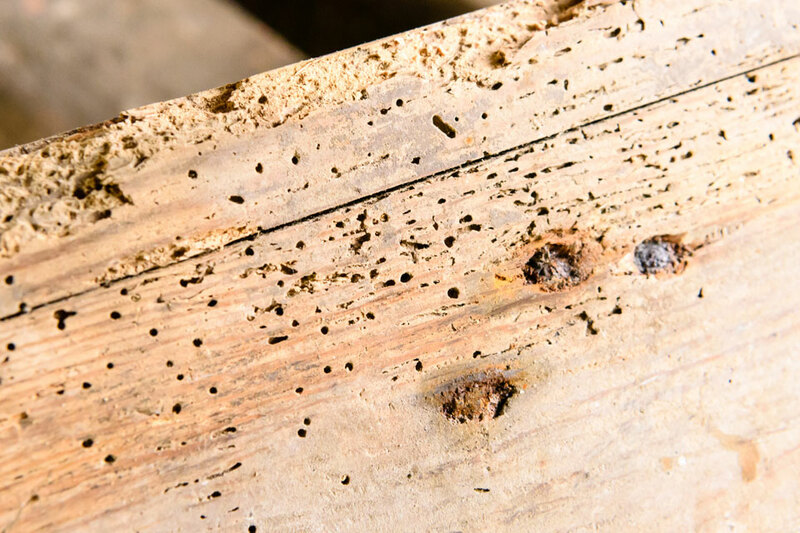 The most common infestation problem we come across is woodworm. Many people believe that "woodworm" is a worm but in fact, it is a beetle. The lavae bore into the wood which greatly reduces the structural strength of beams. The name woodworm is a commonly used generic term for a number of species of wood boring insects.Woodworm thrives in damp conditions. Responsible for about 75% of all woodworm damage to property, attacking both soft and hard wood within the property. The most damaging wood borer in old buildings, attacking hardwood which has suffered some fungal decay. The Death Watch Beatle bangs it's head against wood which makes a distinct ticking noise. It is thought that it does this to attract a mate. Established in the UK post war but already widespread and associated with Wet Rot decay. Small round holes in timber approximately 2mm in diametre. Fine powderey wood dust (known as frass) near the infected areas. Before treatment, the extent of the infestation needs to be assessed. For none severe infestations, a woodworm treatment spray which kills any emerging beatles is sufficient. For more severe cases, it may be necessary to use a variety of chemical treatments and to replace badly damaged timbers with new treated wood. Woodworm found in floor boards.